I consider Dreadstar to be an extension of my family, so it took me a while to feel comfortable letting anyone else take care of this project. It has taken some time, but I know I’ve put my trust in the right team and I’m excited to collaborate with Universal Cable Productions and Benderspink to bring Dreadstar’s unique brand of chaos to television. Dreadstar focuses on Vanth Dreadstar, the lone survivor or the decimated Milky Way, and his strange collection of crewmates, which includes the likes of Syzygy Darklock (I can’t wait to hear that name come from my TV on a weekly basis), a cyborg sorcerer; Willow, a telepath; and Oedi, a kind of cat man. They fight to end an ongoing war between The Church of the Instrumentality and the Monarchy, two ancient, evil empires run by Lord Papal and King Gregzor, respectively. This is a big, ambitious story, one that will require a ton of investment in sets and costumes and special effects, and you have to wonder where it will wind up. One of the big cable networks or a streaming service seems like the best bet, but who knows at this point. You also have to wonder how it fits into the greater Marvel picture. Starlin created characters like Thanos, Drax the Destroyer, and Gamora, so is there a Guardians of the Galaxy crossover in store? Please check your facts. Marvel has nothing to do with this. 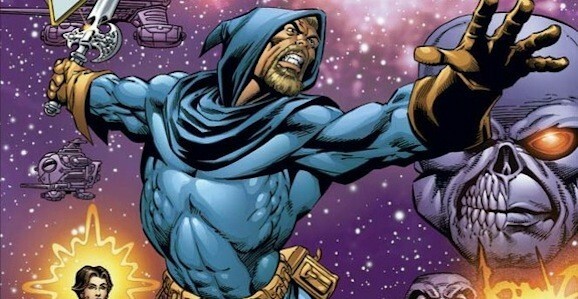 Jim Starlin owns Dreadstar and he always has, though it began at Marvel’s Epic line, which was creator owned. How can anyone confirms that the story is coming to the small screen if the show hasn’t been picked up by a network? Am I missing something?